There's also a handy classroom section on SPR starting at 6:26 in SplitSuit's "Playing AA" video. The stack-to-pot ratio (or SPR for short) principle was coined by Ed Miller in the book Professional No-Limit Hold'em: Volume I . In this article I aim to explain the basics of SPR in poker and show you how it can be used to make your post-flop decisions a lot easier in cash games. This article is merely a brief introduction and overview of SPR. I highly recommend you buy the book to feel the full force of 70 pages worth of SPR euphoria. What is the use of SPR? High, medium and low SPRs. Good hands for low SPRs. Good hands for medium SPRs. Good hands for high SPRs. How to get good SPRs. Example of raising to 3bb. Example of raising to 6bb. 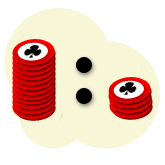 Evaluation of stack to pot ratios in poker. SPR is the effective stack sizes divided by the size of the pot on the flop. To put it another way, in this example the remaining effective stack sizes are 6.3 times the size of the pot. Easy stuff really. SPR can also be considered the ratio of risk : reward. In every no limit hand, the pot is the reward and the size of the effective stacks is the potential risk. Therefore the greater the SPR, the greater the risk : reward ratio. The SPR equation. It's straightforward, but it could still do with some explaining. Important points about working out SPR. You must use effective stack sizes. If you have $150 and your opponent only has $100, then the effective stack sizes are $100, as you cannot win or lose more than $100 against this player. SPR is worked out on the flop only. Stack to pot ratios are not going to be used for the turn or river. II) What is the use of SPR? By taking control of SPR you can make post flop play a lot easier for yourself. Low SPR situations are simple to play, as they greatly reduce the amount of post flop actions and decision that you are required to make because there is so little room for manoeuvre due to the large pot size and small effective stacks. You're not going to be floating the flop and check raising all-in on the turn if the flop is $10 and you have $20 left in your stack. High SPR situations can be a lot trickier to play (depending on what sort of hand you have on the flop) because there is a lot of money left in the stacks to be played with on the flop, turn and river. Different strengths of hands can be more suited to either high or low SPRs. Therefore, if you know what sort of SPRs your hand plays well in, you can manipulate the pot sizes by the way you bet or raise preflop, or avoid certain situations altogether (by folding) to land yourself in a good SPR situation for your particular hand. A) Benefits of SPR example. The best example of SPR is when you have a top pair hand like A K on a flop of K T 9 . We have top pair, but the board is highly coordinated and in all honesty we'd really prefer to bet and just take this pot down on the flop. If the pot size is $10 and the effective stacks are $200, the SPR is 20. If we bet this flop and get raised we are put in a very tricky situation, as we could well have the best hand here but we're not really prepared to commit too much money with just top pair. If we do end up getting it all in on this flop or on the turn or river the chances are that we do not hold the best hand. This makes playing top pair hands like this tricky if the SPR is mid-sized or high. If the pot size is $10 and the effective stacks are $30, the SPR is 3. If we bet this flop and get raised we are in a much more comfortable position to call or raise all-in, as we do not fear further bets on the turn or river. Sure, our opponent could still hold a better hand but the risk here is much lower. We are committed to the hand and so putting all our chips in the middle is a much easier decision. In the two different scenarios above the strength of our hand did not change, yet the outcomes were very different due to the stack to pot ratio. With the low SPR of 3 the risk is much lower relative to the reward, which makes it very easy for us to call all-in with our top pair hand. III) High, medium and low SPRs. These SPR figures are very rough guidelines and their implications will vary greatly depending on how loose or tight your opponents are. They also mean nothing unless we have an idea of which hands play best depending on the stack to pot ratio. A) Good hands for low SPRs. These are the sorts of hands that we do not want to play big pots with, as the bigger the pots get the greater the chances are that we are behind. Low SPRs reduce the number of decisions we need to make with these hands, which makes them a lot easier to play and thus more profitable situations over the long run. With mediocre hands like these, you want to to avoid becoming pot committed after starting with a full stack. B) Good hands for medium SPRs. These are much stronger hands than the ones above and will remain as the best hand when you're all-in often enough to keep them profitable when the SPR is between around 7 to 16. The higher likely SPR also makes it profitable to play more speculative hands like small pocket pairs and suited connectors that infrequently hit big flops, as there is a lot more money to potentially be won from the hand on later betting rounds. C) Good hands for high SPRs. Big flushes and high-end straights. These are the hands that are almost guaranteed to win you the pot. If the SPR is high, you want be be sure that you have near enough the nuts or a draw to pretty much the nuts if there is a lot of action. The last thing you want to do in high SPR situations is get a lot of money in to the pot without a very good chance of winning. IV) How to get good SPRs. Tailor your preflop raises to set yourself up for the ideal SPR. Do not enter the pot in the first place. A) Tailor your preflop raises. You're not always going to have the luxury of tailoring your preflop raises to get that perfect SPR, but when you do have the opportunity you should take advantage of it. i) Example of raising to 3bb. You hold A K and you and an opponent have $100 effective stacks in a $1/$2 6max NLHE game. If you raise to 3bb from MP and your opponent in the CO calls, you will have an SPR of 6.3 ($94 : $15) on the flop. This SPR may well be a little too high for you to justify putting all of your chips in the middle if you hit top pair on the flop, especially so if your opponent is tight as there is a greater likelihood that they are only going to be willing to get all their chips in the middle they will have a better hand than TPTK. ii) Example of raising to 6bb. Using the same example as above where the effective stacks are still $100, let's say we raise to 6bb ($12) instead of 3bb preflop. If our opponent again calls we will have an SPR of 3.3 ($88 : $27) on the flop. With this lower SPR we will feel a lot more comfortable putting all of our chips in the middle if needs be. In addition the chances are that all of the money will be in by the turn, which saves us from a potentially difficult river decision. B) Not entering the pot. If you have a small pocket pair like 44 and the effective stack sizes are fairly low, it is not going to be profitable to raise or call raises as the SPR is going to be low also. With low SPRs you are going to have very little in the way of implied odds (or fold equity if you turn your hand in to a bluff later on down the line), which means that you are far better off folding hands like small pocket pairs and suited connectors if you anticipate the SPR will be low. V) Evaluation of stack to pot ratios in poker. One of the key points that you should take from this article is that planning your hands from the start is vitally important for setting yourself up for profitable and easier-to-play situations later on in the hand. Another key point is just how much of an effect pot sizes on the flop can influence the way you play your cards. You're not always going to be able to grab SPR by the horns and create flop pot sizes exactly how you want them, but nonetheless opportunities to tailor SPR will occur, so don't pass them up when they come around. Trust me when I say that post flop play gets so much easier when you plan your hands and use your knowledge of SPR effectively. Again, this really is the tip of the iceberg when it comes to SPR. I'd highly recommend you pick up a copy of Professional No-Limit Hold'em: Volume I for more information on this topic. This is the book that also contains the invaluable REM process framework. Alternatively, this "concept of the week" article on SPR at 2+2 is also pretty awesome.